This fascinating DVD re-enacts Paul's missionary journeys through Asia Minor, exploring the historical, religious and archaeological backgrounds of Ephesus, Antioch, Tarsus, Galatia and more. Includes English, Turkish and Arabic language tracks. 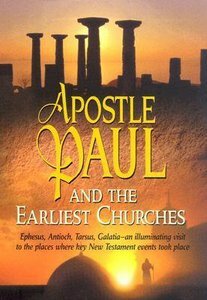 About "Apostle Paul and the Earliest Churches"
SPECIAL FEATURES: -English, Turkish and Arabic language tracks -Chapter titles for easy scene access -Study guide in .pdf format Apostle Paul and the Earliest Churches: Paul in Asia Minor is a brilliant and illuminating production. Beginning with his conversion, it reenacts Paul's missionary journeys on Anatolian soil (modern Turkey). This brief, 48-minute Christian DVD contains an archaeological treasury: mosaics, frescoes, statues, amphitheaters, agoras, temples and more. The historical, religious, and archaeological background of each Anatolian region in which Paul preached the gospel is explained. Yet Apostle Paul is more than an archaeological or historical survey; this production's reenactment of the miracles Paul performed, the difficulties Paul encountered, and the persecution Paul faced beckons the viewer to experience with the Apostle himself the birth of the Christian church. The films archaeological emphasis is enhanced by 3D animated maps and footage of Antioch on the Orontes, Pisidian Antioch, Ephesus, Tarsus, and other cities important to Pauls ministry. Significant artifacts from a variety of Turkish museums are also discussed.